Do you get the Sunday paper or the daily delivery? If so, you might be dealing with a bunch of left over newspapers that are either sitting on your kitchen counters or stacked in a pile in the garage. Sure you could put them out to be picked up with the recycling, but you could also use them to help yourself save money or help keep yourself organized around your home. Finding ways to upcycle newspaper is pretty easy once you really sit and think about it. We love upcycling things in our house. We find ways to upcycle milk jugs, we find ways to upcycle sheets, we find ways to upcycle towels and we even find new uses for clean kitty litter. I love to reuse glass jars and bottles for when I make a lot of the things we stopped buying and started making at home and I even reuse things when we’re preparing for summer storms and winter cold! Upcycling truly is a frugal activity so if you consider yourself frugal but aren’t doing it? You should start. Living frugally is a lifestyle and not something that you can do halfway if you want to be successful at it. It’s part of knowing how to really build wealth for yourself and understanding that your thoughts can keep you from attaining the wealth you desire. When you upcycle things, you are trying to get at least one more use out of an item. 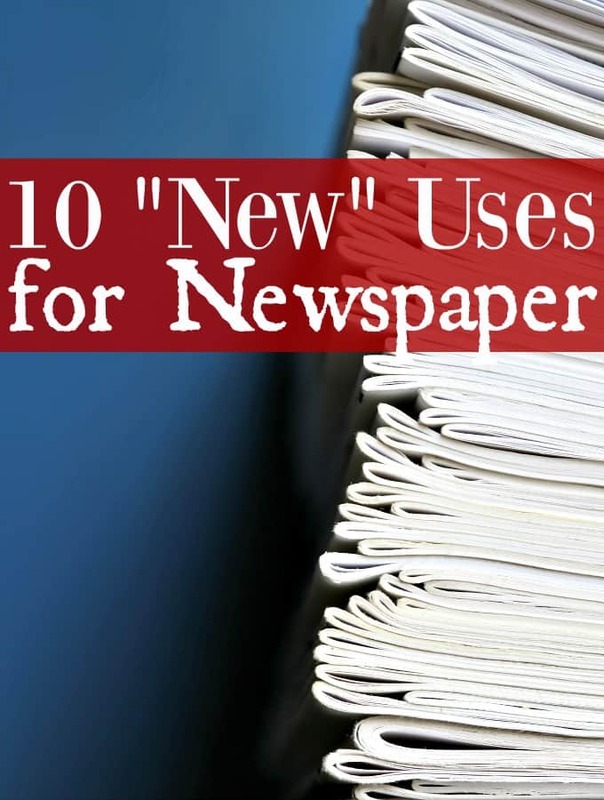 These 10 ways to upcycle newspaper below can help you do just that with the Sunday funnies. Glass Christmas ornaments are so easily broken and if you have a few treasured ones, you’ll want to protect them the best that you can. Luckily, you can upcycle newspaper to help with that. Wrap all your glass ornaments and fragile pieces in one sheet of newspaper before you store them away in an ornament storage box before putting them away for next year. If you’ve got other glass treasures that need protected, you can wrap them too. I personally like to wrap them well then secure the newspaper with a piece of tape. I’m wrapping it because I want it to stay safe so I feel like keeping the paper in place helps do that a little bit better. If you have a cat, it can be hard to keep your litter box from smelling and deodorizers are expensive. One of the new uses for newspaper that you can do is to line your litter box with it. Even if you use the best clumping cat litter out there, some urine will still very likely still soak through to the bottom. With a litter box lined with a thick pad of newspaper, any that does get through gets soaked up for easy clean up and less smell. If you have other animals that live in a cage such as a rabbit or hamster, you can also line their cage to make clean up easy and keep smells down. When you’re ready to clean either instance, just grab the paper by one edge and slide out. Paper towels are costly so if you don’t have any unpaper towels handy, newspaper will work to pull the grease off of your food. To use it, line the bottom of your plate or bowl with a few layers and lay your food on top. Just keep in mind that you can’t use any foods that are “wet” since the newspaper will cling to anything like that. This means that this new use for newspaper will work better for foods such as bacon, onion rings, and fries. Your grandma did it when she cleaned her home and you should be too. The single best way to get a streak free and clean window or mirror is to clean it with newspaper. Use a rubbing alcohol/water mixture for your cleaning solution then wipe with newspaper. What you’ll be left with is a window that is so clean, you’ll forget it’s there! Fried green tomatoes might be tasty for some, but if you’re wanting to ripen them quickly? Newspaper can help. Wrap your tomatoes (or other fruits and veggies) that need ripened in newspaper then set in a cool place where they won’t be disturbed for a day or two. They’ll ripen quicker with the help of the newspaper. This is one of my favorite ways to upcycle newspaper. Grab your kids, scissors, markers, craft paints and more and cut old newspapers into strips. Use the strips to create an awesome paper mache craft and let your kids design until their little hearts are content. To make paper mache paste, mix 1 cup water with 1 cup flour until you get a thick glue like consistency. Stir out any lumps (you can add more water if needed) and use to glue your creations! It doesn’t stop with paper mache though. You can use newspaper in so many different crafts that you will never get bored! You can use strips to make a recycled paper basket, or make recycled paper beads and so much more! Make a bowl, make place mats, make a wreath or even wall paper out of your old newspaper stacks! There are so many possibilities that it really does make this one one of the better ways to upcycle newspaper out there. The next idea for ways to upcycle newspaper is for you gardeners. If you have a garden to save money on groceries, you’re likely pretty familiar with composting. Adding newspaper to your compost pile can help make it richer for your plants. It can also be used to start a compost pile if you don’t already have one. Be sure that the newspaper you are using uses non-toxic ink and cut into strips or pieces before mixing into the rest of your mix. Any parent that has had their child do crafts on their table knows how messy they can be. Newspapers are a cheap way to add a layer of protection for your furniture when they’re getting crafty. Whether you are painting pictures with your kids or painting your living room, laying down newspaper can help keep everything safe from paint drips or spills, glue drops and more. If you go camping or hiking a lot or if you like having bonfires, you know how hard it can be sometimes (especially after rain) to find dry wood for your fire. My absolutely favorite of all of these ways to upcycle newspaper is to make it into paper bricks. You’ll need to have a brick mold, but the process is fairly simple. Scrunch up your newspaper, dunk into water, pile into your mold then press the water out of the mold. Let it sit and dry and voila! A paper brick! It’s actually as simple as that, but if you’re looking for a full tutorial on how to make paper bricks, Den Garden has a very nice one. Skip buying expensive rolls of gift wrap for the holidays or birthdays and instead, use newspaper. Not only will you wrap your gift for cheap, but it’s a great conversation piece too! Wrapping a gift for a child? Use the Sunday funnies as their wrapping paper! This actually works well with brown paper bags as well so keep that in mind too the next time you toss those grocery bags.